Andrei Vasilevskiy allowed 1 goal on 29 shots for the victory. That's 2 quality starts out of his last 3, including the command performance in the Frozen Dome game. Now, if I'm Zettler, I declare Vasilevskiy the hot hand and see if I can ride him a little while. Time to see if that talent can translate to more results. Even without superior centermen, I feel Syracuse should score plenty of goals. They'll go as far as the goaltending takes them, though. Cody Kunyk, Philippe Paradis, and Vasilevskiy were the game's three stars. Kunyk pots the GWG and the insurance goal in a good night's work. Paradis has 5 goals and 6 points in 3 games this week, essentially daring Bolt Prospects not to select him Player of the Week. With 2 helpers, Yanni Gourde now has 9 goals and 18 points in 13 November contests. He and Jonathan Marchessault are now tied for 8th in the AHL in scoring (at the moment of this posting) with several others, 4 points back of the leader. Realizing it was his last chance, Cody Kunyk made a case for a contract. Looking to continue his career past the collegiate level, Kunyk registered more than a point per game in his senior season at the University of Alaska-Fairbanks. 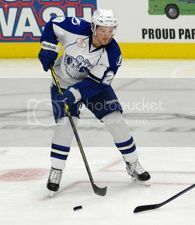 Kunyk earned a deal in March, but now the 24-year-old is the oldest rookie on the Syracuse Crunch roster and is out to prove himself again. "My last year was definitely my best year," Kunyk said. "Being an older guy, I had to play with a chip on my shoulder. I knew that there wasn't going to be a tomorrow. I had to make my own path. I gave it everything I had every game, and I was fortunate enough to sign a contract." "I think it adds a little more grit to my game," he added. "I feel like I have a little bit more to prove since I'm an older guy." Bingo pulls away in Crunch preseason opener in Lyon, France. Andrei Vasilevskiy went the distance and allowed 5 goals for the loss. Cody Kunyk, Jerome Samson, and Joel Vermin were Syracuse's goal scorers. TAMPA BAY – The Tampa Bay Lightning have re-signed forward Cody Kunyk to a one-year, two-way contract today, vice president and general manager Steve Yzerman announced. Kunyk, 24, made his NHL debut with the Lightning on April 13 at Washington, logging 10:12 in ice time. He was signed by Tampa Bay as an undrafted free agent on March 20, 2014. The Sherwood Park, Alberta native skated in 37 games for the University of Alaska-Fairbanks Nanooks last season, posting 22 goals and 43 points to go along with 22 penalty minutes and a plus-13 rating. The 5-foot-11, 197-pound forward led the Nanooks for goals, points, power-play goals (six) and shorthanded goals (two). Kunyk was named the WCHA's Player of the Year and to the First Team All-WCHA team. He also led the WCHA for scoring during the 2013-14 season. Kunyk skated in 148 games over four seasons at the University of Alaska-Fairbanks, amassing 60 goals and 133 points. He set career highs his senior year for goals, assists (21) and points. Kunyk became the 30th Nanook in program history to join the 100-point club with a goal on November 22, 2013.